When is a Stamp Not? A simple answer is when it's a label. Depending on how one defines philately, this may eliminate many postal related items. Three labels are shown with this column. The U.S. Post Office Department, the last one by the U.S. Postal Service, issued two. None of these labels ever had any franking power, did not pay for postage, yet all are clearly related to the carrying of the mails. They are used to repair damaged covers, or to seal those letters opened in transit, by the dead letter office, by postal inspectors, or those received unsealed. The designs have been few and relatively nondescript. The 1872 issue included the word registered in its design, indicating its original intended use. All later issues of the USPOD depicted Mercury, and the words "Officially Sealed" in their design. A number of major printings and varieties abound in the various issues. Scott lists about 20 major types in their U.S. Specialized Catalogue. A large number of minor varieties also exist. As the seals were issued for about 100 years, this is not too surprising. The first shown here is OX 10, issued in 1900. The next is OX19C, believed issued in 1970. The design shown in the latter, simplified from earlier stamps in 1919, saw use for over 50 years. At least 4 or 5 different perforations and combinations exist, with variations. The purpose remained a constant. Labels printed in the 1870s were typically engraved, and those printed since were either done by typography or lithography. With one or two exceptions, the seals are inexpensive, although no means easy to find. When the U_S. Postal Service was fo rmed in 1971, they changed virtually all their forms, labels and insignia. The postally sealed label was no exception. First seen by collectors in 1972, this label was Used until fairly recently by the service. Some offices may still be using this particular design, as many millions (perhaps even billions) were printed and distributed. At least 5 or 6 different perforation types are known, and perhaps even more exist. While not generally available to customers at their local post offices, quantities in collectors' hands seem substantial. Many are available for pennies, and even panes of 5 and whole pads of panes have been seen at shows and in dealers' stock. 1868. It was sold, along with its thirteen cent brother for face value only at the Honolulu Post Office_ Originally these two stamps were listed in the main listings, but were "demoted, but kept their numbers" to the special printing section_ Remainders of this stamp were eventually overprinted "SPECIMEN." and sold off Scott lists the overprint as 10S. Later, officials deemed a portrait stamp necessary for sale, and so created the "Reprint" (an official imitation) of 1889, which used the same plates with retouching. On August 19, 1892, all of the remaining reprints were overprinted with "REPRINT". Both versions of the reprint were available for sale for a period of time in Honolulu. Scott assigned the number 10R to the Reprint, and 10RS to the overprint. Both the reissue and the reprint are usually available at about one-tent h the cost of the "originals". With most administrations, funds are always necessary, and often this leads to taxes or fees. In 1877, the Kingdom issued a set of revenue stamps to show payment for a variety of fees. Some of these were overprinted in 1893 when the republic was declared to create a twenty-cent value, but most continued to be used without overprinting. 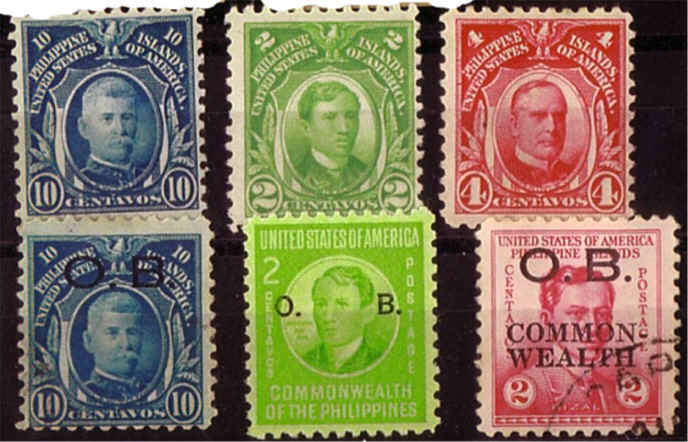 A new $1 stamp was issued in 1897, and these, with additional printings continued on into the 1920 era. The last listed printing in Scott's is R13-l6, listed as reprinted between 1910 and 1913. The later stamps can be identified by their perforation (12), while the earlier stamps, such as this 1877 fifty cent value were issued rouletted(8). So, for a small price, one can own a piece of the tropics. Moreover, for those who "only collect U.S.", this is a fairly exotic part of our country. 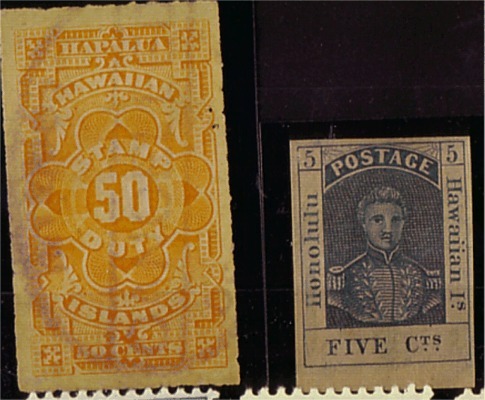 Whether postage or revenue, some stamps from Hawaii are relatively affordable. The 1882-86 and 1893 overprint and 1894 republic sets generally cost less than their Columbian Exhibition contemporaries when similar denominations are compared. While their cost is generally not prohibitive, I suspect you will have to search more places to find these mementos of aloha, than for a more mainstream issue. The Philippines Islands have had several governments. Spain controlled the islands for several generations, but lost them after the Spanish-American War. Admiral Dew ey occupied Manila on May 1, 1898, effectively signaling an end to Spanish rule. In July 1899, military occupation changed to civilian gover nment. From March 1899 until July, United States stamps were used for mail. Beginning in July, United States stamps overprinted "Philippine Islands" were prepared for use. Several issues were overprinted, serving the population until 1906. In 1906, the Bureau of Printing and Engraving prepared the first of many issues for the Philippines. This long set featured both Americans and Filipinos who contributed to the history of the islands. The set went through several printings and lasted until 1926, when it was briefly supplanted by the locally printed Legislative Palace set, issued to celebrate the palace's opening. The 1906 set continued, sometimes with others, until replacement in 1935. The U. S. Bureau of Engraving released the lengthy pictorial definitive set in February 1935. This set saw extensive use, and all values are readily available. The Philippines became an internally self-governing Commonwealth in November of 1935. 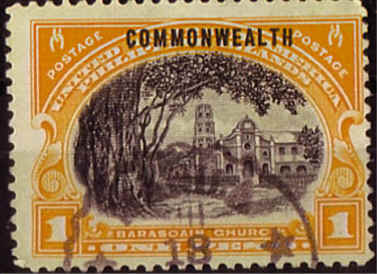 A number of stamps were overprinted with the word "Commonwealth" to celebrate the changed status. Illustrated is the One Peso value fro m the set. 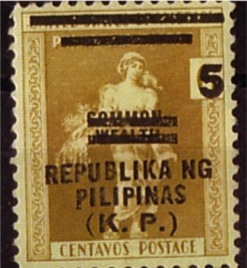 S hortly afterwards, the Philippine Bureau of Printing released the first of several "Commonwealth" Issues. Part of the premise of the commonwealth was that eventually the United States would withdraw from control of the islands. This was initially planned to be a gradual ten year stage, but World War II intervened, and full independence wasn't granted until the formation of the Republic of the Philippines on July 4.1946. Just as in the United States, special stamps were issued for differing classes of mail and mailers. To serve governmental departments, stamps were issued for "Official Business". Simply overprinting the definitive with the letters "O.B" created these. At varying times, stamps from the 1906, 1935 and 1941 sets were overprinted O.B. The 1935 set overprinted "Commonwealth" in 1936 were also overprinted "O.B", an interesting double overprinting. The Philippines had an extensive airmail system by the late 1920s. 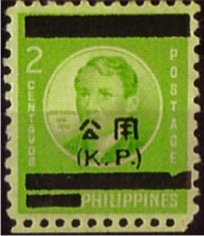 A number of airmail stamps were released as fairly important connecting point, and an exotic one at that, about three dozen stamps were created to celebrate various airmail flights, in to and out of, Manila. The first of many Pan Am Clipper flight was celebrated by two 1935 airmail stamps. Getting as much as you can from a stamp show requires some advance preparation. WISCOPEX ’04, which will be held April 24-25, 2004, in Iola, has something for everyone, and you can use it to sharpen your skills for show attendance. For many collectors, the retail bourse is the main attraction of any stamp show. On the sales floor you will find stamp dealers who may specialize in various aspects of the hobby. At smaller, regional shows you may be familiar with them all. If you’re a good customer, some dealers may even bring some offerings to fit you and your specific collecting desires. As of March 1, 13 dealers had signed up for the WISCOPEX ’04 bourse, and at least seven more tables may be filled by show time. Dealers are a great source of information on the hobby. Especially if they’re not busy with other customers, they are usually eager to explain items in their stock or answer questions. The chance for conversation like this is an overlooked feature of stamp shows. Also, you should talk with fellow collectors – at the lunch table, for instance, or while waiting to see a dealer’s wares or looking at exhibits. Exhibits constitute the main way for philatelists to share their hobby with their fellow collectors and the general public. While you may feel awed or puzzled by some elaborate exhibits, you also may find some among the five categories of judged exhibits at WISCOPEX ’04 that pique your interest in the hobby. Exhibit awards are announced at a banquet Saturday night. This is another opportunity to talk with fellow collectors. The program at the dinner also will include a talk on philatelic exhibiting by Mary Ann Owens, who has had several medal-winning exhibits, even on the international level. Tickets for the dinner are $15 and must be ordered from Maurice Wozniak, N8275 County Road G, Iola WI 54945, before April 9. An unusual feature at WISCOPEX ’04 is a series of short talks on various aspects of philately. At these sessions, you’ll be able to learn from expert collectors and ask questions. -- The sponsoring Wisconsin Federation of Stamp Clubs, which will offer show-canceled cacheted covers for sale. In keeping with the theme of the show, "The Lure of Hobbies," the pictorial cancel features a fishing lure, and the cachet shows two anglers in a small boat. Also at the Federation table, you can get tickets for hourly philatelic door prizes. You’ll be able to get information on the area stamp clubs that make up the statewide Federation, and the booth is another excellent place to talk about the hobby. -- A Postal Service station offering more current stamp products than might be available at most small post offices. -- Tables featuring the people and firms that made Iola "the community hobbies made famous." Krause Publications will have tables for its stamp products as well as the many other books and periodicals that made it the world’s largest hobby publisher. Jones Publishing will feature its Teddy Bear and Doll periodicals. Chet Krause, founder of the company that still bears his name, may offer tours of his old car collection, which will be sold this summer. The Iola Old Car Show, which attracts more than 100,000 visitors every July, will have a display. -- A booth where youths and other stamp collecting novices can get information and hands-on practice. A workshop leading to a Boy Scout merit badge on stamp collecting will be held Saturday afternoon. -- A literature table where you can pick up flyers on forthcoming shows and other information. -- A concessions area offering beverages, snacks and luncheon selections both days of the show, with the tables and chairs providing another way to relax and discuss stamps. The free show will be held in the Iola Old Car Show Activity Center, 130 Jenson Dr., on the east side of the village of Iola, just off Hwy 161 near Krause Publications. I recently received a small lot of territorial covers with average prices from an out-of-state dealer. After casually looking them over, I was attracted to the Fitchburg (Dane County) cover shown above. A quick check of "The Territorial Post Offices of Wisconsin" revealed that I had a cover from a village with only three territorial covers documented as of 1.963. With a smile on my face I placed the cover in my desk drawer and forgot about it for several days. Finally I got around to writing my check in payment for the lot. As I gave the Fitchburg cover another viewing, the date May 29 suddenly rang a bell - since the year was 1848, this was the first day of statehood. I guess I will always study territorial covers very carefully before I decide to purchase or return them to the dealer. the Clerk on September 19, 1848, and apparently not opened until February 26, 1849, nearly nine months after it was postmarked. Presumably it was filed until the next session of Court convened in Janesville. Several months ago, I received an e-mail from a lady in another state; a total stranger to me. Before dismissing just another piece of spam - after all, she was addressing me by my full name, I read her interesting philatelic message. She identified herself as the granddaughter of an elderly lady living in a Milwaukee suburb. The two women were looking for someone to assist them in getting an appraisal and possible disposition of a sizeable stamp collection left by the grandfather. Before getting involved, I asked my e-mail correspondent why she had contacted me. She replied that she'd seen my name on the internet involving stamp stuff in Wisconsin. It turned out that the place was the Website of The Wisconsin Federation of Stamp Clubs. I explained that I was not qualified to appraise a stamp collection, but that I would contact the grandmother, look at what she had, and take it from there. Grandma is a sprightly and sharp lady in her early 90's, still driving and enjoying life. It turned out that there were four albums of stamps, a carton of loose stamps with nonphilatelic material mixed in, and a large envelope with some FDC's and loose stamps. I explained to Grandma that I felt that, although much of the material was quite old, there was nothing that indicated she would get much, if anything for the collection. Grandma permitted me to take the material to a reputable stamp dealer in the area, explaining she'd been offered something less than a hundred dollars some years ago. Between my health problems and the dealers delay, months passed (Grandma was very patient) before I could contact the dealer. It wasn't easy returning the old stamp collection to Grandma, telling her the dealer was unable to offer anything for the material. Condition was a problem. It had been in the basement and some stamps had been fastened to album pages with something other than hinges. She took it well, explaining that she'd been offered forty dollars some years ago, but sentiment wouldn't let her part with it. This episode is a wonderful case in point of how small our philatelic world has become through the internet and websites such as our WFSC website. Hank Schmidt indicated he was going to send ATFP a notice on the death of Howard Angermeyer, a member of the Oshkosh Philatelic Society. Howie was not drafted early in WWII, received a job deferment, but was drafted late in the war. After training left by ship for the South Pacific. The destination was classified and no information was given. Howie without being told knew what port they had arrived at. He recognized the topography and buildings from his study of his postage stamps. The family isn't sure, but the location may have been Port Moresby in current day Papua New Guinea. How often don't collectors tell others that our hobby is educational, with many of us learning more history and geography as we collect? After sending the ATFP the interesting story told by the family of Howard Angermeyer I thought I could do some research. Not being a worldwide collector I don't have a personal copy of the Scott catalogues. 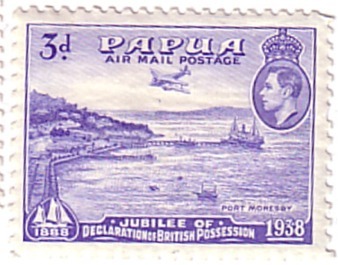 I used the OPL copies and found there is in fact a series of five stamp (C5 -C9) showing the harbor of Port Morseby in current day Papua New Guinea. The stamp was issue in Sept. 1938, leaving plenty of time to be in the collection of Howie before he entered the Army late in WWII. See illustration below.